Jurlique Herbal Recovery Antioxidant Face Oil (Protection) and Purely Age-Defying Firming Face Oil (Firming) will be launching in Jurlique boutiques and counters in Australia on the 25th of March 2013 to stand alongside one of Jurlique’s best selling skin care product, Skin Balancing Face Oil (Hydration)! These multi-action facial treatment oils specifically targets a skin concern, whether you require, skin protection, firming or hydration, and balances the skin moisture levels with 100% natural botanical and essential oils. Jurlique Facial Treatment Oils are formulated without Paraben, PEGs, Colourants and Preservatives. When I received the Herbal Recovery Antioxidant Face Oil to trial, I was excited to determine how this face oil folds out to grant my skin a healthy glow! Herbal Recovery Antioxidant Oil contains precious oils and antioxidants such as Olive, Grape Seed, Soybean Oil, Avocado Oil, Squalene and Blackcurrant Seed to draw out excess sebum from pores, strengthen the skin’s barrier function and prolong the ageing of skin. The list of luscious ingredients doesn’t just stop there! 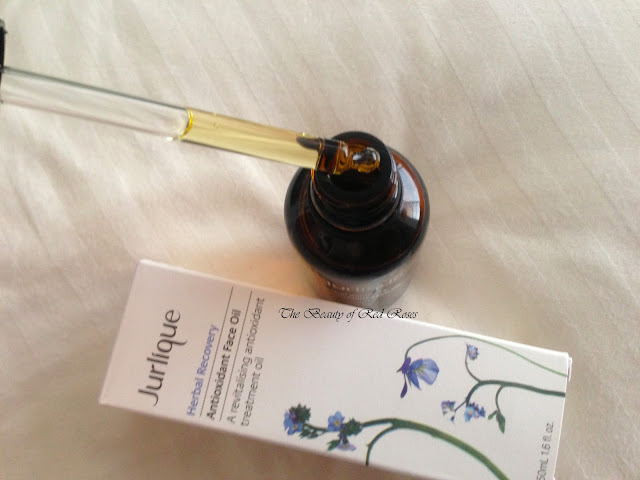 Jurlique Herbal Recovery Antioxidant Oil also contains precious botanicals and unique Biodynamic blends consisting of Chamomile, Spilanthes and Horsetail. This Biodynamic blend helps to rebalance the skin moisture level, nurture and nourish the skin while help restore the skin’s radiance. It’s no wonder that this light golden face oil evokes a wonderful and uplifting scent of aromatics, which relieves my senses and replenishes my skin. My skin feels smooth, soft and supple that I just can't get enough of this face oil! I normally dispense a couple of drops of the lightweight Herbal Recovery Antioxidant Oil onto my fingers and gently massage onto my face prior to applying my night cream – this way I could maximise the benefits of using my night cream. As I apply the Herbal Recovery Antioxidant Oil while taking a deep breath, my skin and body feels deeply relaxed, as the scent is incredibly divine! The face oil is non-greasy and doesn't leave any greasy residue after application. Another great way to use this face oil is to apply a few drops to the skin prior to using a facial mask as the skin will remain moisturised while nourished after rinsing our the face mask. Alternatively, applying a few drops to the neck and décolletage also helps to nourish and boost hydration as often the neck and décolletage are neglected when applying skin care products to the face. 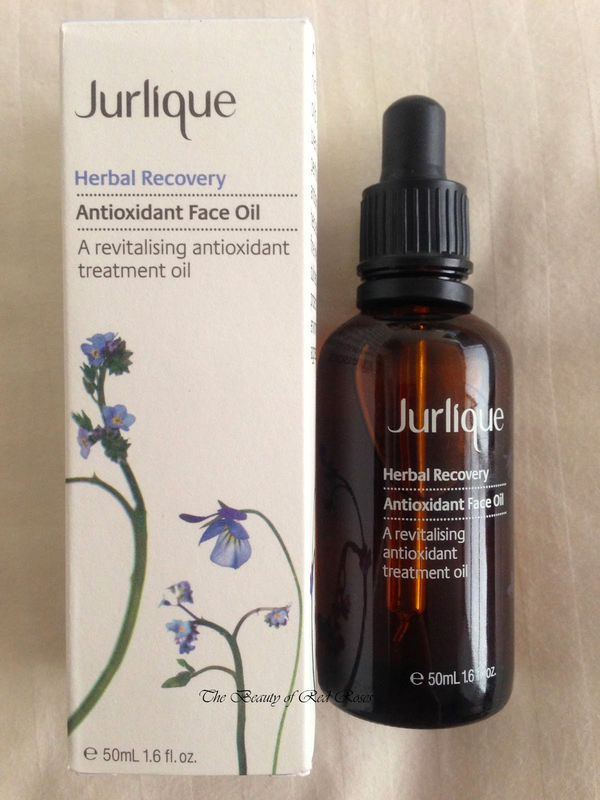 Jurlique Herbal Recovery Antioxidant Oil is an excellent facial treatment oil which simply hydrates, nourishes and gives me a lovely relaxing experience as a night treatment product. It’s also great to see that Jurlique has extended their facial treatment oil range so that you could use one that specifically targets to your skin concern. Jurlique Herbal Recovery Antioxidant Face Oil, Purely Age-Defying Firming Face Oil and Skin Balancing Face Oil retails for A$65/50mL each. Jurlique products can be purchased online or in-store. Currently there is a Jurlique GWP offer with every purchase online where you could choose a 2-week deluxe sample of one of the three Jurlique Face Oils. Enter the code BALANCING, PROTECTION or FIRMING at checkout before 20th March 2013 11:59pm CST. Offer is only available at www.jurlique.com.au. Which facial oils do you love using? Have you tried Jurlique's Skin Balancing Face Oil before? Product was provided for consideration only. This review is 100% based on my own thoughts and opinions. 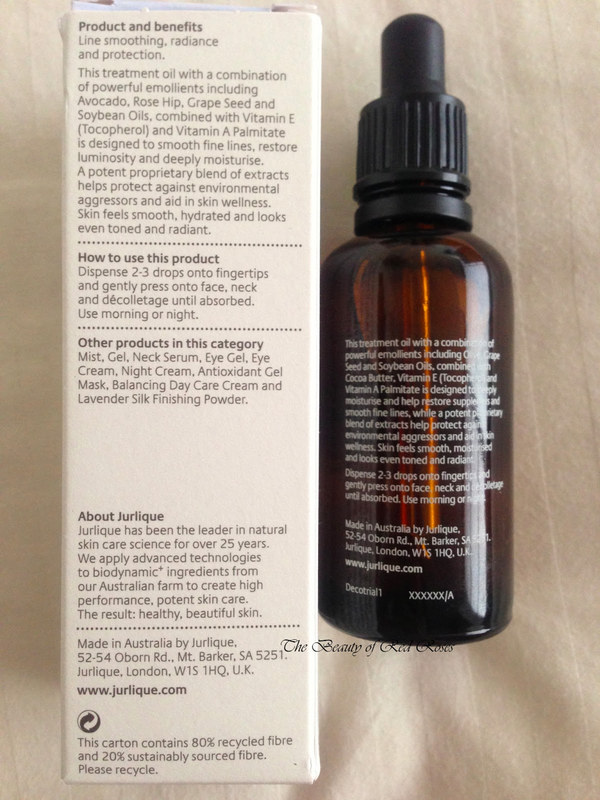 I am not affiliated with Jurlique and did not receive remuneration to post this product review. Kiehl's Midnight Recovery is also another great face oil, however, Jurlique Herbal Recovery AO Face Oil has such a calming and aromatic scent to it that it makes me feel so relaxed! Enjoy your time there as they have so many different products to suit every skin concern!